Looking back over the last year and looking ahead to the next is something that we all do and on/around 31 December is usually when we do so. It can be at a New Year's Party or indeed just at home quietly enjoying some time alone or with family/friends. 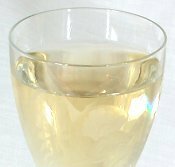 Whatever you do over New Year someone in your family will doubtless be doing a little cooking or baking - if that person is you and you think an alcohol-based homemade ice cream is appropriate, then here's a recipe that's truly in the spirit of a New Year's celebration - white wine sorbet. It's really easy to make too, especially if you have an electric ice cream maker. The sweetness of the wine plus the orange and lemon juice make for a really refreshing sorbet. Then there's another option if you want to make an ice cream that's a little more challenging but nevertheless alcoholic in flavor - you could try this coffee, rum and walnut ice cream recipe. Rich but oh so creamy! My thanks to all the regular readers of ice-cream-recipes.com for visiting the website in 2007. I hope you will all return in 2008 and continue to enjoy the new recipes and information that I so much enjoy offering. I wish you all a very Happy New Year.